Despite being about Vice Principals and a high school, keep your children far, far away from this series. Imagine that the high school Principal (Bill Murray; Groundhog Day) leaves his job unexpectedly without any replacement being named. Also, imagine, the two Vice Principals (Danny McBride; This is the End and Walter Goggins; American Ultra) of the same school are arch enemies and desperate enough to the point that they would do anything to ensure the other one did not get the job. Now imagine that the School Board brings in an outsider as the new Principal, Dr. Belinda Brown (Kimberly Hebert Gregory; Red Hook Summer) and glosses over either of these men getting the job. Can you imagine what chaos will be created? Close your eyes and picture the chaos left behind by creating a vacuum that resulted in ISIS and you have the HBO series – Vice Principals. Ok… maybe comparing this series to terrorism is a bit strong, but, clearly, these two Vice Principals are terrorizing the school that they are sworn and bound to protect. Neal Gamby (Danny McBride) and Lee Russell (Walter Goggins) are two head honchos who will stop at nothing to get ahead. Their antics are so outrageous that one cannot even relate to these characters in the work force. By the time the mid-season has hit, Gamby and Russell have vandalized the Principal's house, set it on fire, defecated in a fountain, and spit in her coffee. Oh, don't think I've ruined all the surprises – it just keeps getting worse. Thank goodness that although McBride and Goggins' characters seem like incompetent nincompoops, Gregory's character, Dr. Belinda Brown, is a strong commanding woman, who clearly knows how to handle the bad stuff in life. Despite the on screen hatred for Dr. Brown, it is clear throughout the series that both Russell and Gamby come to respect – and dare I say it- even like the new principal- each for their own reasons. Nonetheless, don't expect this show to end on all smiles and hugs. Despite Gamby and Russell finally coming to terms with their co-dependent and really unhealthy relationship with each other, they never give up their dream of ousting Dr. Brown and taking over her job. Although they act like complete idiots, Gamby and Russell do have human moments. Gamby is father who is trying to bond with his daughter and, on occasion, you can see his protective side of Dr. Brown, despite trying to ruin her life. Russell lives with his mother in law, who is so nasty to him, that even though she speaks only Korean, you have a feeling you know exactly what she's saying. Despite that, he seems to have a connection with Dr. Brown. However, don't let that fool you. He's still out to get her and he'll let nothing stand in his way. Along with McBride, Jody Hill created, produced and directed this series with collaboration from David Gordon Green. The saving grace of this series is, frankly, the actors. McBride and Goggins are really superb actors. They each get into character and while the dialogue is rude and crass, it flows naturally. Gamby's love interest, Amanda Snodgrass (Georgia King; One Day), his ex-wife played by Busy Philips (Dawson's Creek) and the cafeteria manager, Dayshawn (Sheaun MCKinney; Know Thy Enemy) are all fabulous in their supporting roles. Kimberly Hebert Gregory does a spectacular job as Dr. Brown and reminds me of Dr. Bailey from Grey's Anatomy. She is spunky, determined, and focused to the point that people forget she has feelings until she is seen crying in her car. Even with all of these wonderful actors, the character's actions are so over exaggerated that you cannot really relate to any of them. The one character that was "real" was Ray Liptrapp (Shea Whigham; Silver Linings Playbook), Gamby's ex-wife's new husband. He tries to show his efforts into getting along with his wife's ex and makes a profound statement towards the end to which almost every parent can relate. The advantage of HD digital download is you can watch it anywhere, anytime and you can purchase it before the Blu-ray is in stores. The picture quality is excellent with sharp details and the audio is full and lush. The extras include some enjoyable features such as a cast interview and a two minute preview of the second season. Despite being about Vice Principals and a high school, keep your children far, far away from this series. The language is amazingly foul and crass and the actions of the main characters are exactly the opposite of what you want to teach your children. While everyone is touting this as a dark comedy, there was almost nothing funny about this show. Sadly, no matter how great the acting is or how smooth the show flowed, not even Season 2 can save this series. For a network that puts out Game of Thrones, Vice Principals is quite a disappointment. 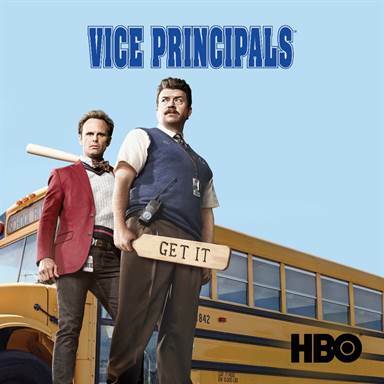 Download Vice Principals from the iTunes Store in Digial HD.